There’s only 106 days until Christmas! Santa is busy Determining Naughty or Nice!! Are you on the nice list? Consider asking Santa for our Christmas Mystery. This is a brand new canvas from our newest artist, David Galchutt. So excited! 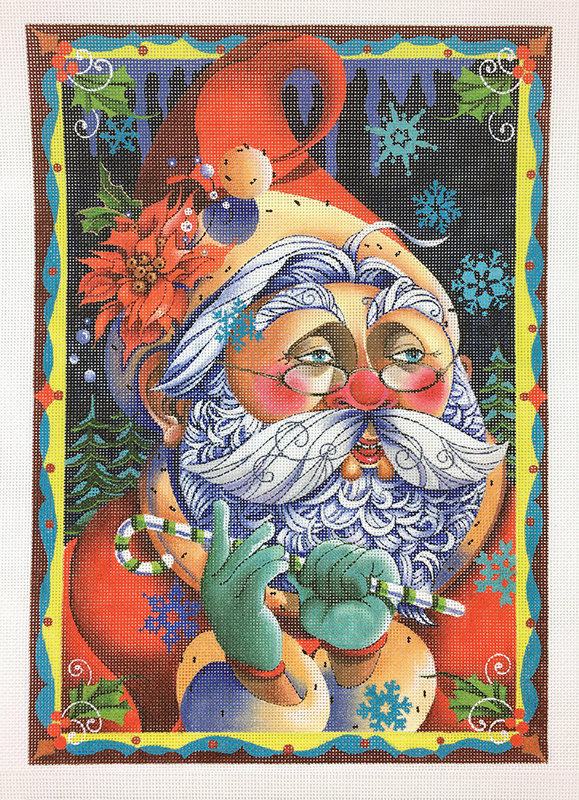 Santa is 10 x 13 handpainted on 18ct. We will stitch this canvas over 4 lessons. Classes will be November 13, December 4 and 18th and January 15th; Sunday afternoons from 1-3pm. You can join us in person or long distance. Full details on the class are on the website. Class size is limited. Please sign up early to reserve your space and ensure you receive your canvas in time to start with the rest of the class. Hope you love our Santa. Wondering what you mean by 'more traditional'? Lisa and I were talking last night about how exciting your Salmon Mystery and Run Bunny Bunny have been in introducing such fun new ideas.